I have a UEFI drive that I use to boot two of my PEs for loading images and such. 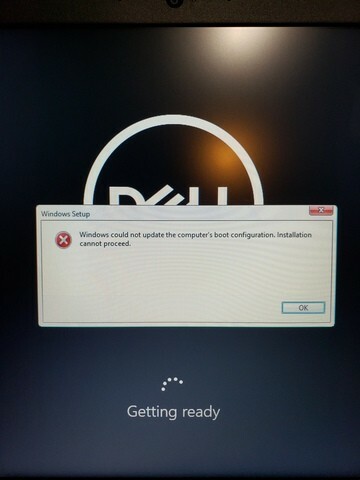 Lots of times the computer will reboot when the image is done installing and will boot back to my USB drive instead of the C drive. I want to add a 3rd default timed entry to the BCD menu that says "1. Boot To System HD" but I can't seem to get the entries right in the BCD to do so. How should the entries in the BCD look to accomplish booting to the system HD from my UEFI BCD menu instead of one of my PE choices? cdob, thanks so much! You've always been super helpful over the years. The /p /d command is what I was missing. I have been out of the boot game for 5 years or so, so I 'm a little rusty coming back into things. I use WinNTSetup from my Mini10PE to load my images and I have reboot turned on in my ini. These new laptops no matter how I set the boot stuff in bios will always boot to the USB again and I have stepped away to come back to Windows 10 not being setup yet and has booted into my PE again. The code I used above worked great on the computer I ran the command from. What I mean is I can boot the HD from the BCD menu on the computer I ran the command from, but I assume those BCD entries as specific to that machine. I need entries in the BCD that would boot any Win 10 drive from the BCD. IMHO you should think the other way round. I.e. have the "default" boot on the USB stick to always (if no user intervention happens) go back to boot the hard disk, and you should be able to do that easily if you add (say) GRUB2 as your "main" USB stick boot manager. Another entry (if manually selected) will chainload the BOOTMGR.EFI on the same USB stick. I think we are talking about the same thing. In my BCD I would have "Boot To System HD" as the default entry so when the secure boot UEFI laptop boots to the USB drive the default choice would boot the system drive so when I return from whatever I am doing, the load process would be complete. Less user interaction. I will need to read up on Grub2 and secure boot. Like I said been out of the boot game for a long time. I was hoping it would be just a simple entry I could make in the BCD to accomplish this. If I use the command cdob, posted above this allows me to boot the system drive from my BCD menu but only on that computer I ran the command from. 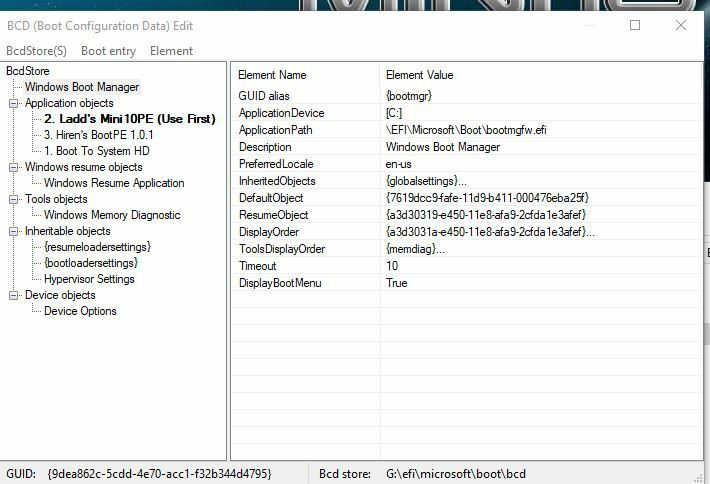 I'm not sure if what you are proposing is possible with the Windows boot manager (bootmgr and UEFI variants). See here for my attempts at documenting BCDEdit and the BCD store. Maybe look into the Locate device type (here) and in particular the Using the Locate Device in Multiboot Setups section of this page and do some experiments. Instead of using a tag file, simply use a file that is likely to be present on the HDD and not present on the USB device you are booting from. http://reboot.pro/to...e-4#entry207893 about a month ago. Edited by LostNspace, 09 November 2018 - 08:41 PM. Yes, locate works at USB UEFI too. Paste the appropiate GUID number. The tag file "\Windows\system32\winload.exe" is used in both. The winload.exe isn't there. Is that 12000002 correct? Edited by LostNspace, 09 November 2018 - 10:31 PM. Thanks for the reply. I will look into this method as well. Just curious tho will grub2 boot in any secure boot situation? What I mean is the way I have my three boot options set up now I know this will always be secure boot compatible because it's legit Microsoft files. It's a shame I would have to use something like grub2 just to boot the system drive when my other two PE boots work so well from the BCD. I actually installed grub2 files from the secure boot Ubuntu as mentioned above by 911CD.net and added this to the grub.cfg and was able to successfully boot Win 10 on my secure boot laptop. 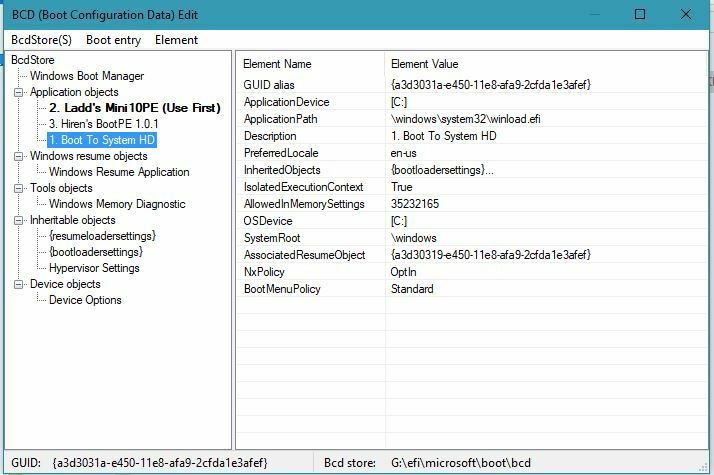 This entry selected from USB EFI Boot menu is working OK for UEFI Secure booting of Windows 10 from local harddisk. Thank you! I will give this a try. What Windows version are you using bcdedit from? I'm not exactly sure what I am doing wrong but I did as you suggested, wimb. This is how my entry looks after. Your entry seems OK and corresponds well to mine. Is your entry still not working ? I tried it again from scratch. And this is the error I am getting. This is on a Dell Laptop (new) with secure boot on. Edited by LostNspace, 11 November 2018 - 03:09 PM. What is the partitioning of your USB drive ? MBR or GPT with/without EFI partition ? I have no explanation for this but I booted into my WinPE because I had to re-image that laptop any way. I left the newly created entry as you suggested in my BCD with that "Boot To System Drive" as the default with a time out. WinNTSetup finished applying the image, the computer rebooted, booted to the USB drive as usually, my custom BCD menu came up and I let the timer go and it actually booted to the Win 10 machine. Everything seems to be working now. 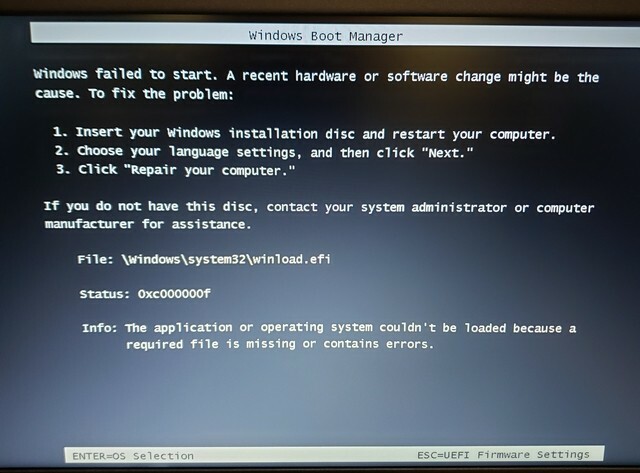 If I pull the USB out while this message is up and the little circle is spinning, the circle will freeze like it's connected to the USB as far as the boot loader. If I unplug the USB before setup starts and let the system drive boot and finish the install and then boot the system drive from my bcd on the USB all is well. It's something that doesn't like the fact I booted the system drive from the bcd before the install could complete. I guess what I am saying is that as long as the OS is fully installed I can boot the system drive from my USB with no problems but on a reinstall the system doesn't like me booting the drive from my USB BCD. Edited by LostNspace, 11 November 2018 - 08:18 PM.